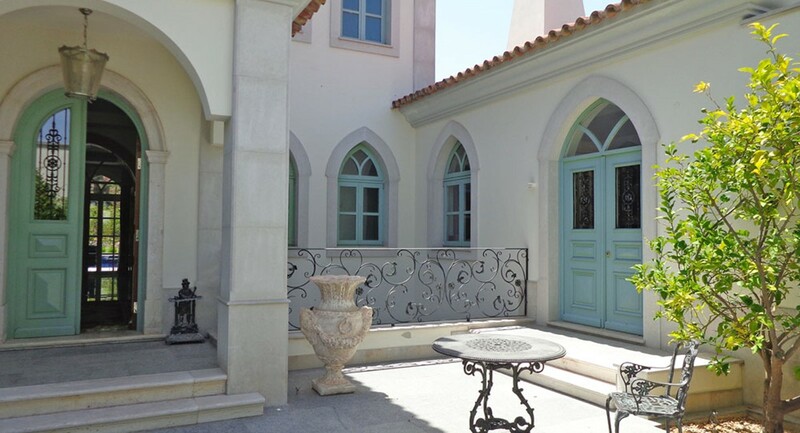 Ask Azure "This property is a stunning example of a luxury villa in Portugal. The impressive gated entrance and drive is reminiscent of a bygone era, and yet it is a stunning modern property. 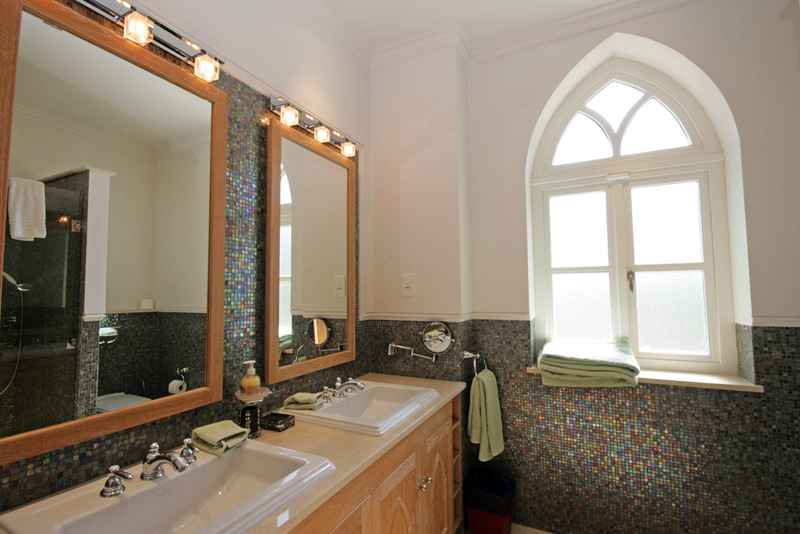 Full of high quality finishing touches - this is a villa in a class of it's own". 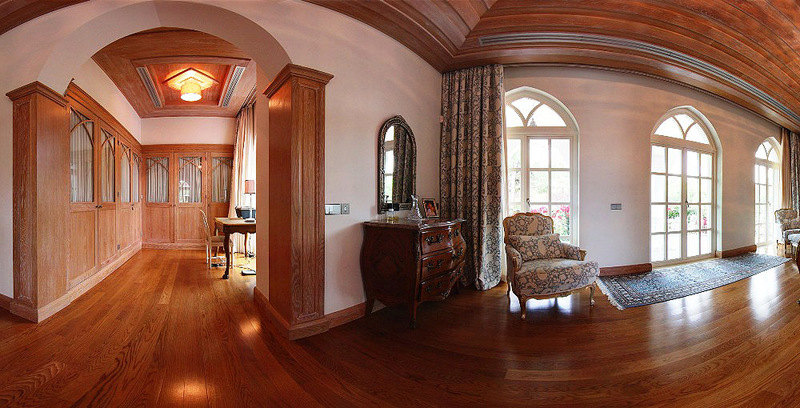 As you arrive at this villa you cannot help but be amazed by the palatial qualities before you. Imposing and impressive, the white washed walls and arched windows give an air of exclusivity and this is echoed in the neighbourhood as you approach the villa. 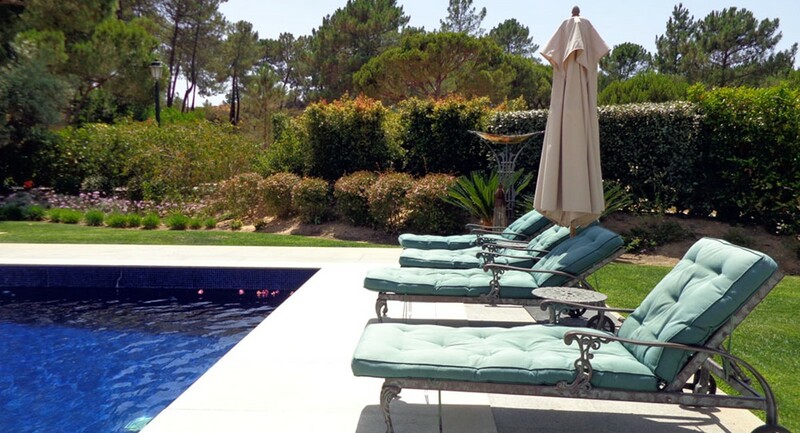 Located in a quiet exclusive area of Quinta do Lago this gated property sits on a spacious corner plot offering great landscaped gardens for you to relax in and enjoy. 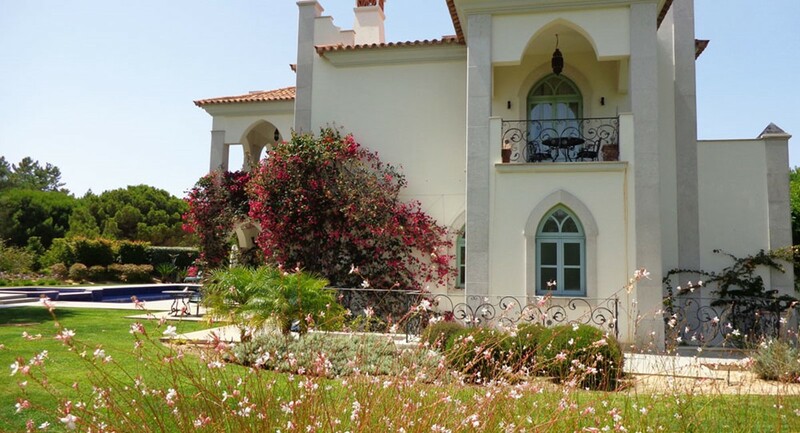 Surrounded by golfing fairways this is a perfect golf villa location as well. There are several aspects to the outdoor areas. The well maintained grass areas are surrounded by mature trees providing a secluded and private boundary to the property. 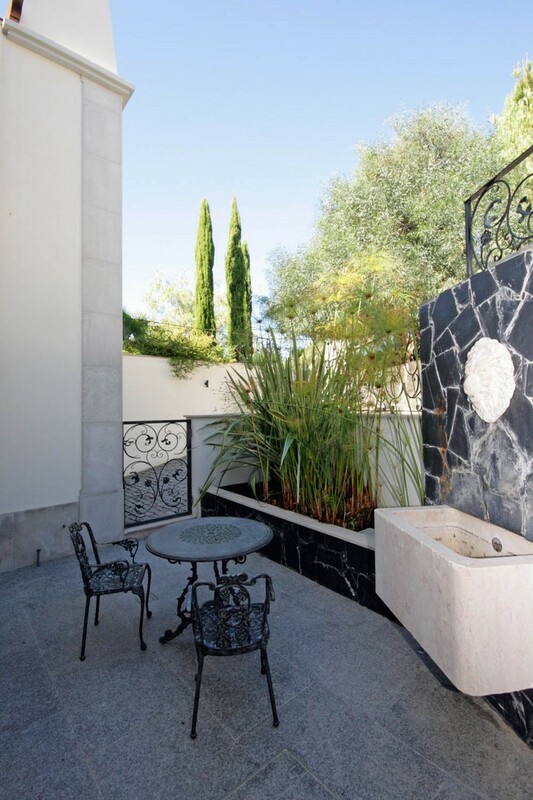 As you look back towards the house creeping vines climb the pillars of the balcony and outdoor terrace areas which gives an overall feeling of quality. At the front of the property there is a small courtyard area with table and chairs, which is a lovely suntrap at certain points of the day. At the back there are large terraced areas covered as well as open. 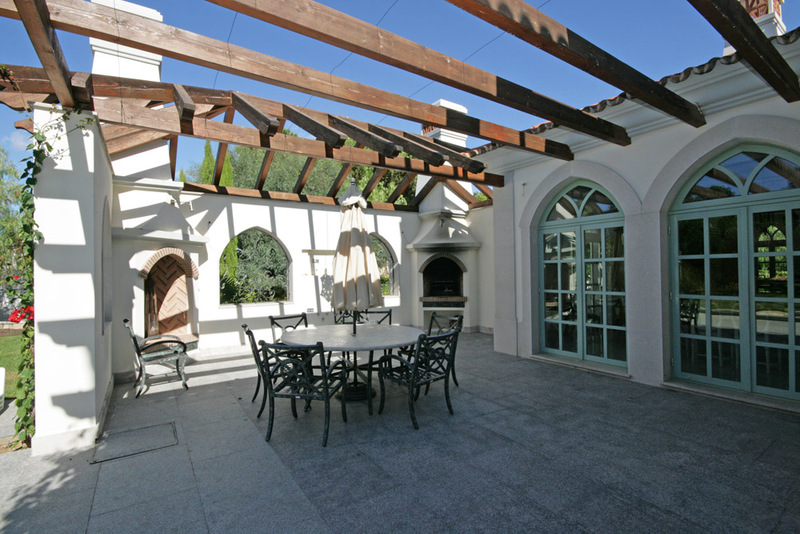 You can make the most of alfresco dining with a well equipped barbecue area as well as an outdoor fire place, perfect for relaxing away the evening hours with good company and a glass or two of wine. 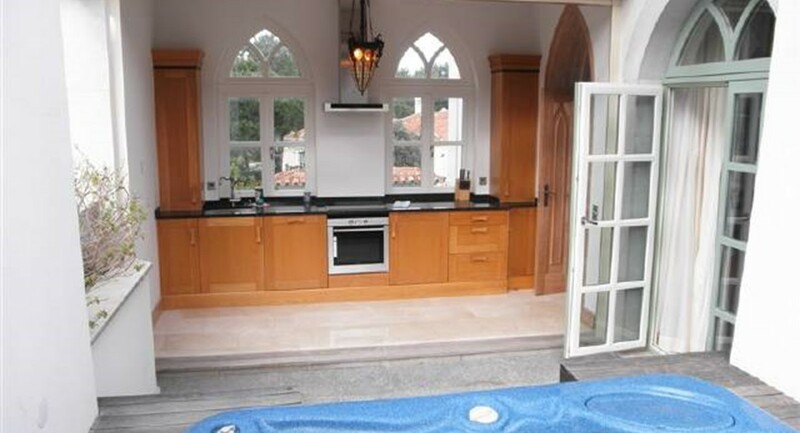 There are two jacuzzi's, one by the bbq area and one at the corner of the pool. 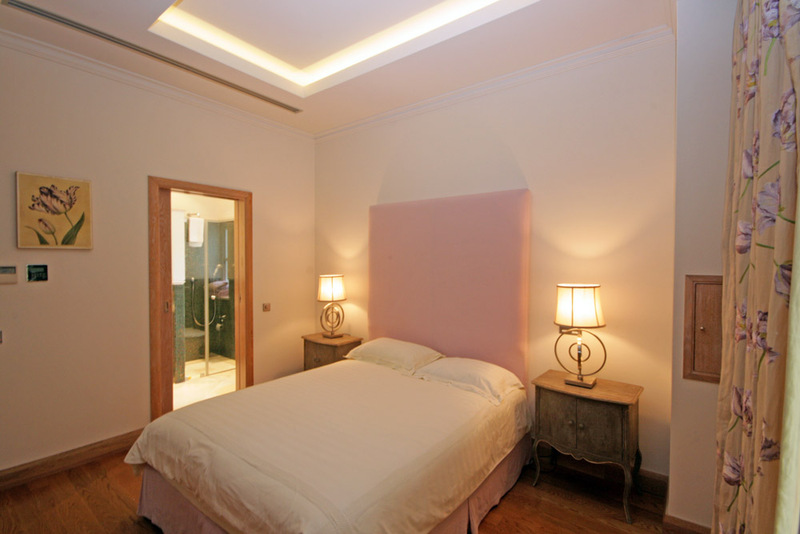 This is a six bed six bathroom villa, providing enough space for the largest families, or group bookings. 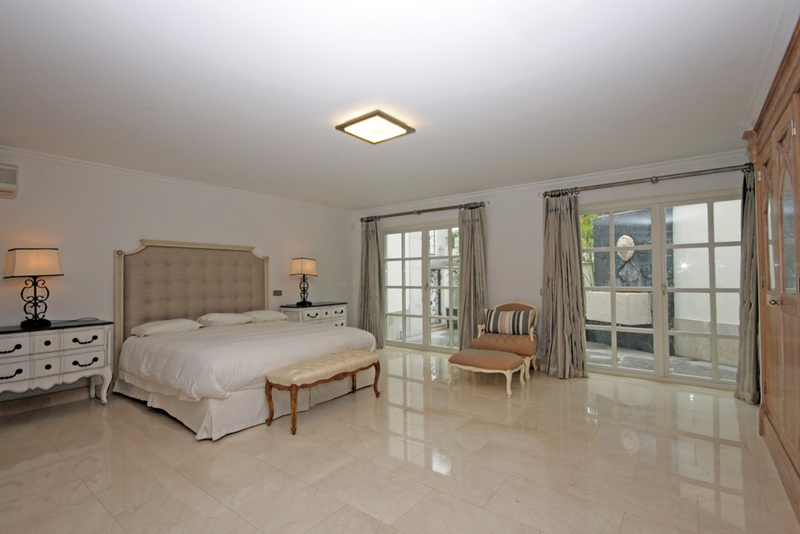 The master bedroom is on the top floor and is a wonderful room. 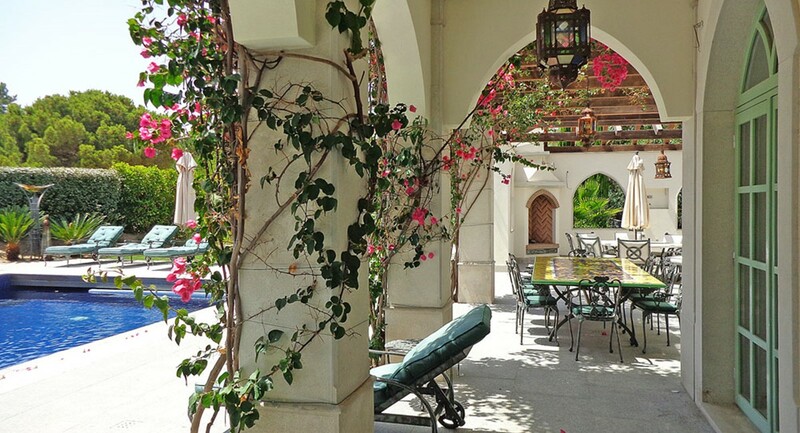 It boasts a large balcony area and sun terrace with a table and seating for 6 as well as sun loungers. 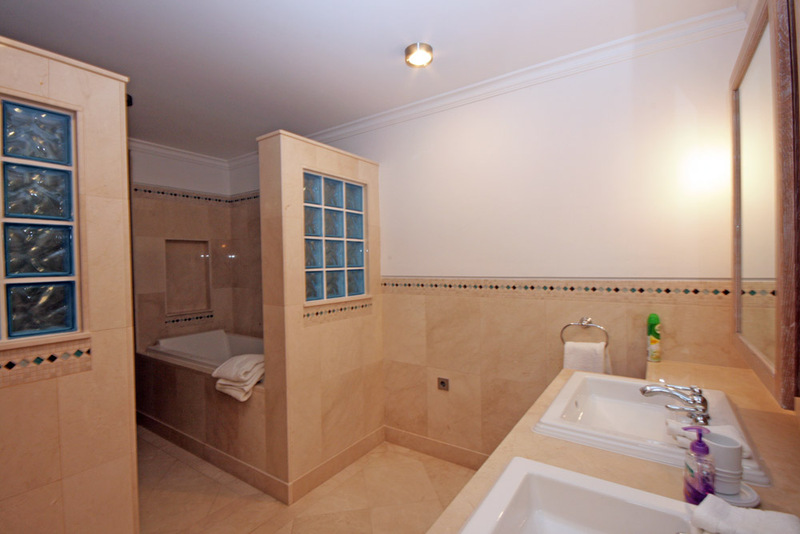 A Jacuzzi bath is the centrepiece of the en-suite bathroom, flanked by two separate basins which produce a top quality bathroom that suits the impressive nature of the master bedroom. 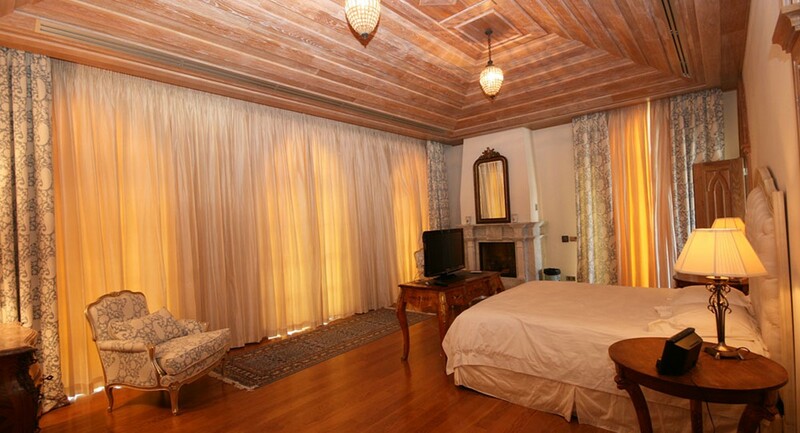 This beautiful room also boasts a king size bed and separate kitchen. Whilst also housing an office for those needing to work whilst on holiday, and also a walk in wardrobe and laundry chute. 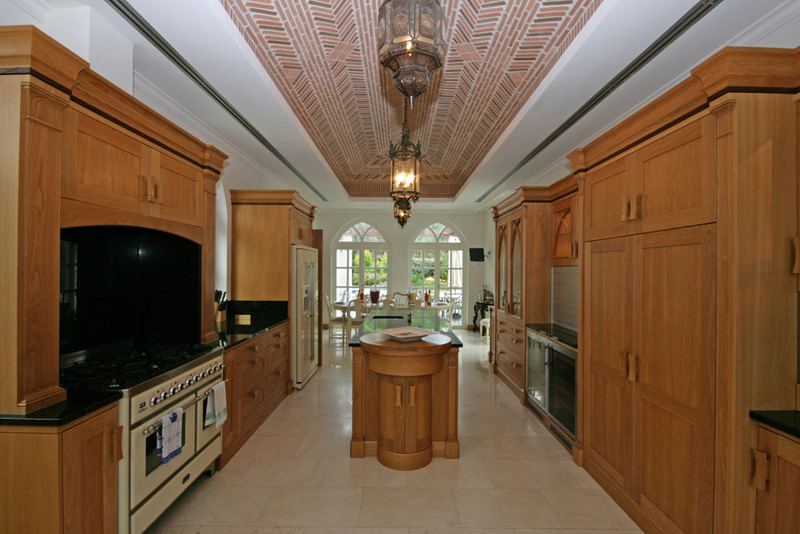 The kitchen is stunning, not surprising as it is a Mark Wilkinson design and features a large island in the centre with plenty of workspace all around. 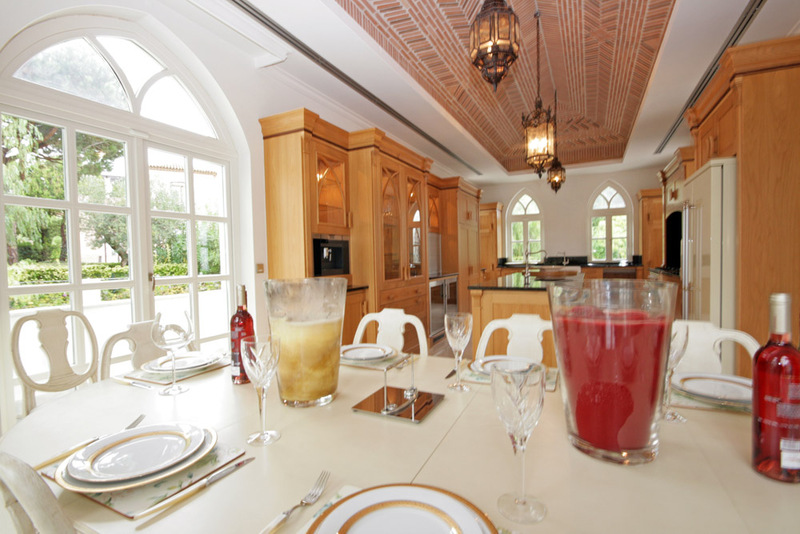 There is an indoor dining table at one end of the kitchen for those rare times when you might need to eat inside and gorgeous and ornate ceilings and light fixtures line the kitchen which is just one example of the attention to detail that has been paid to every aspect of the property. 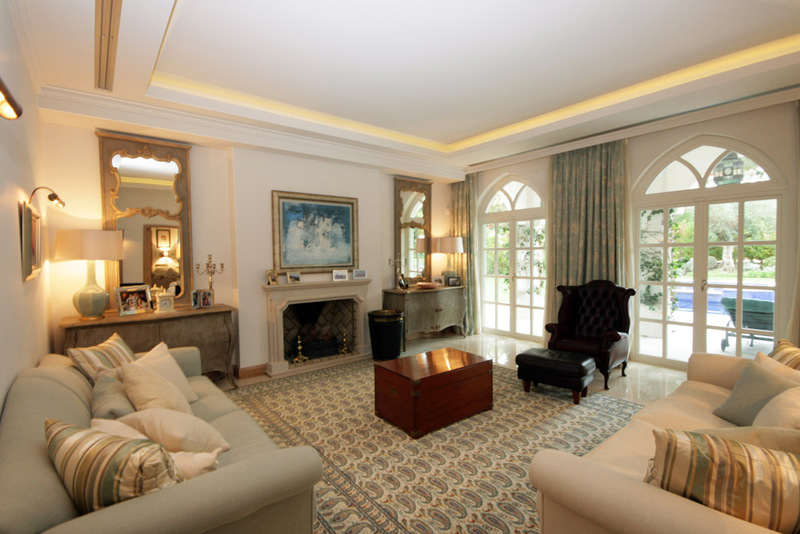 Traditionally decorated living areas are sumptuous and relaxing. A large lounge with comfortable sofas and arm chairs leads to a snug room with plasma screen TV with sky and DVD player, providing a separate area to the main lounge for relaxing and watching TV. 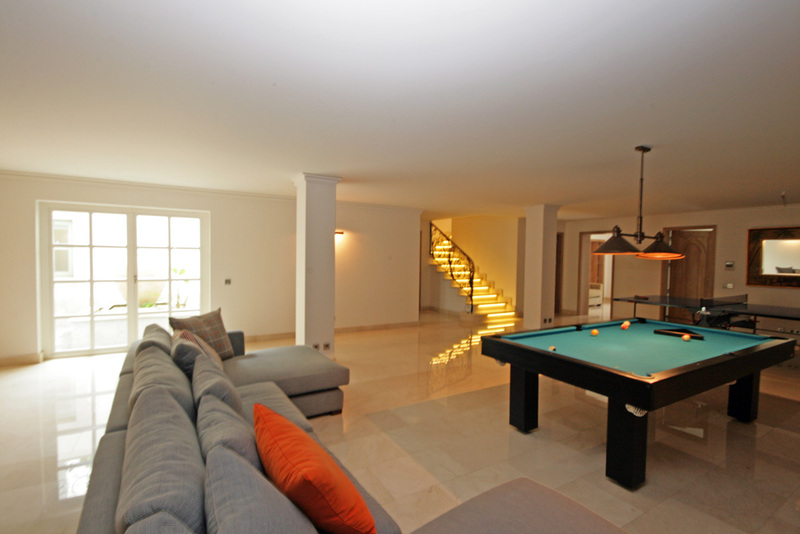 There is a games room with pool table on the basement floor with two further bedrooms on this floor. 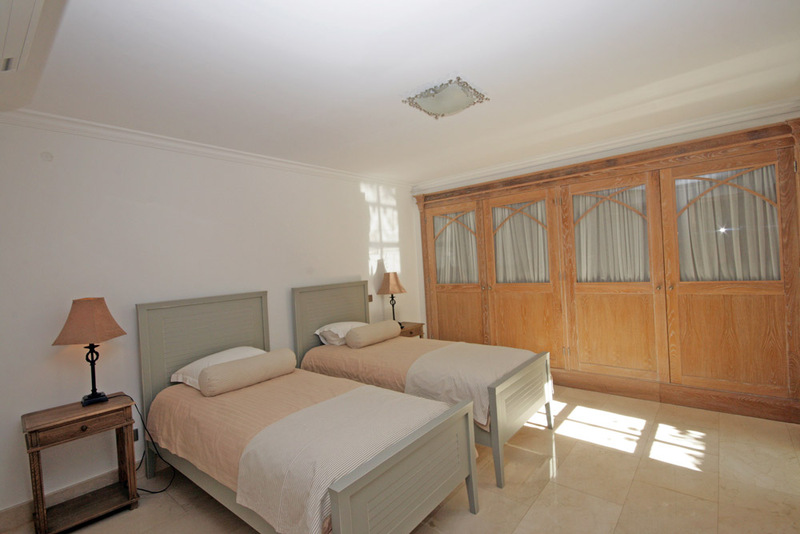 A double and a twin room, both en-suite and with separate access is really useful for guests needing an entrance separate to the house. 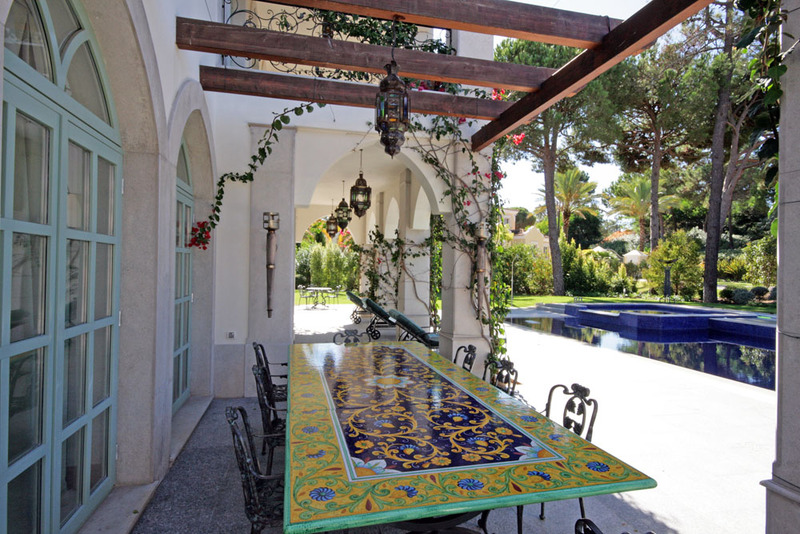 The area surrounding this villa is sporting heaven! With so many golf courses to choose from including Vale do Lobo course, which is only ten minutes from here, you will be able to play a different course each day. 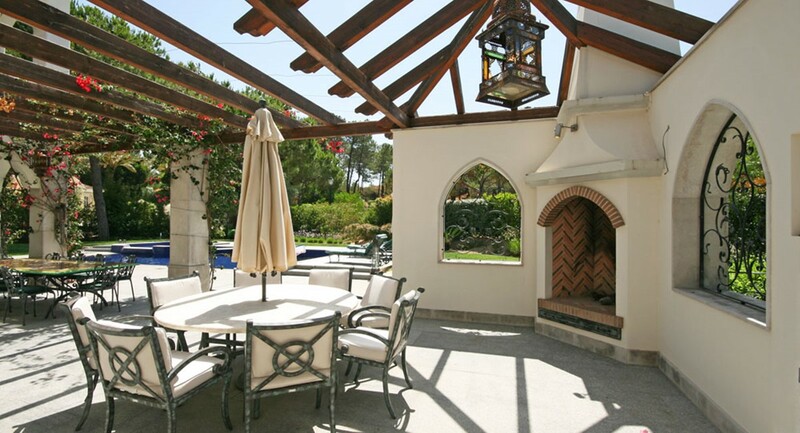 This really is a great villa for a golf holiday. There is also local tennis at two local tennis centres. Not only that there are several of the Algarve's finest hot spots for water sports, deep sea fishing areas and many other activities. 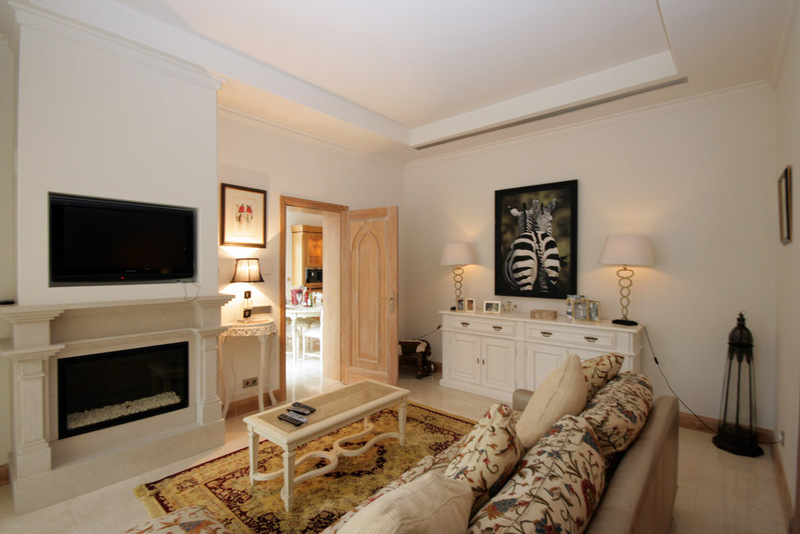 The villa is short walk from Quinta do Lago's shopping area where you can find boutiques and designer products to satisfy even the most avid shopper. There are many wonderful restaurants bars and pubs within walking distance of the villa as well. The shopping at the Bougainvillea Plaza also is not to be missed, there are supermarkets and banks, and any other number of shops for things you might need. 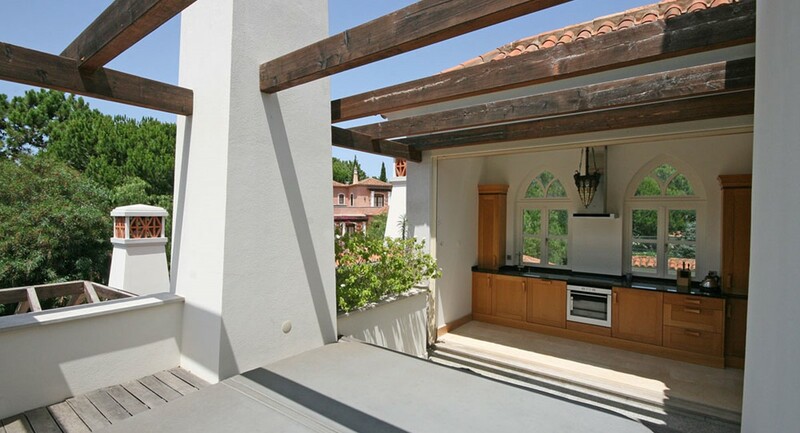 Quinta do Lago beach is nearby and accessed by a long walkway over an estuary. This part of the Rio Formosa Nature Park is well known for its stunning beach at the other end of the bridge. There is a restaurant which serves the most delicious fresh fish right on the beach, and boat trips are available to explore the Algarve from the coast. 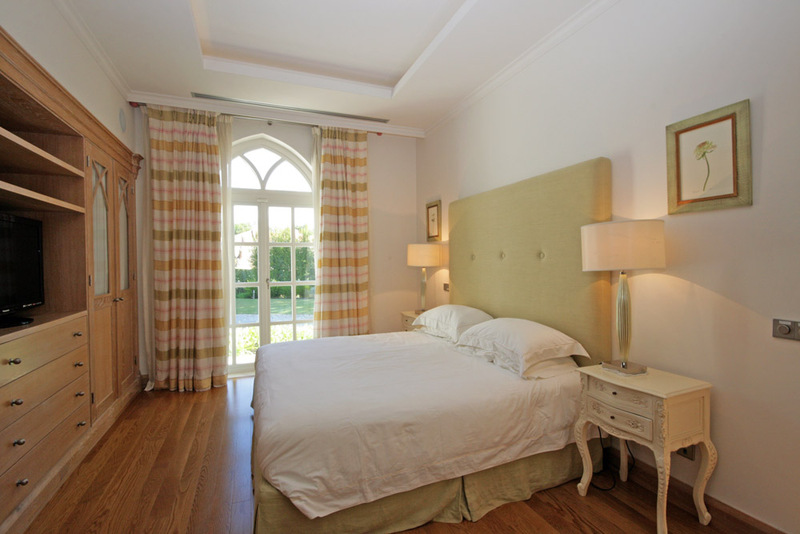 This villa is books up very quickly so call us today to make sure you get the chance to stay in this wonderful Quinta do Lago villa. Contact us by phone or by using the forms below. We look forward to helping you find your perfect holiday villa. You can read our guide to Quinta do Lago here.